Worcester Prep freshman Natalie Brushmiller battles for a rebound during Wednesday’s game against Saints Peter & Paul in Berlin. Worcester won 51-8. Worcester Prep senior Julia Godwin makes a layup during Wednesday’s game against Saints Peter & Paul in Berlin. 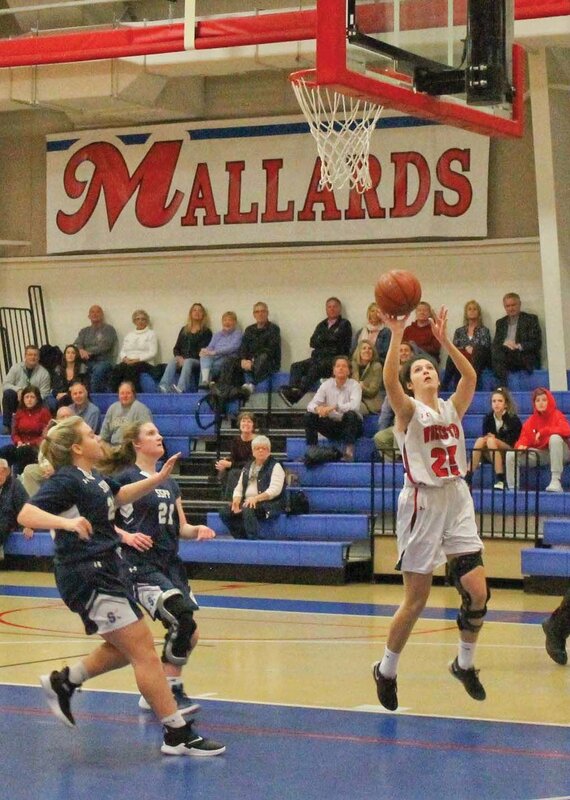 (Feb. 15, 2019) The Worcester Prep girls’ basketball team secured the top seed in the Eastern Shore Independent Athletic Conference tournament with its 51-8 victory over the Saints Peter & Paul Sabres on Wednesday in Berlin. The Lady Mallards also captured the regular-season championship title. “It’s our third championship in four years, but our first solo regular-season championship, so that’s what we were fighting for tonight,” Prep Coach Scot Dailey said. Worcester shut out Saints Peter & Paul, 15-0, in the first quarter. At halftime, the Mallards led 29-6. By the end of the third quarter, the home team had pulled ahead 39-8. The Berlin squad outscored its opponent 12-0 in the fourth quarter. Dailey said the last few years the Mallards struggled to score, but this season, they are putting points on the board. Senior captain Gracie Gardner had nine points, six rebounds and five steals. Senior Hannah Merritt added nine points and five rebounds. Senior captain Hailey Merritt chipped in eight points and three steals. Sophomore CC Lizas contributed seven points, six rebounds and three steals. Worcester improved to 14-2 (11-0 ESIAC) with the victory. As the No. 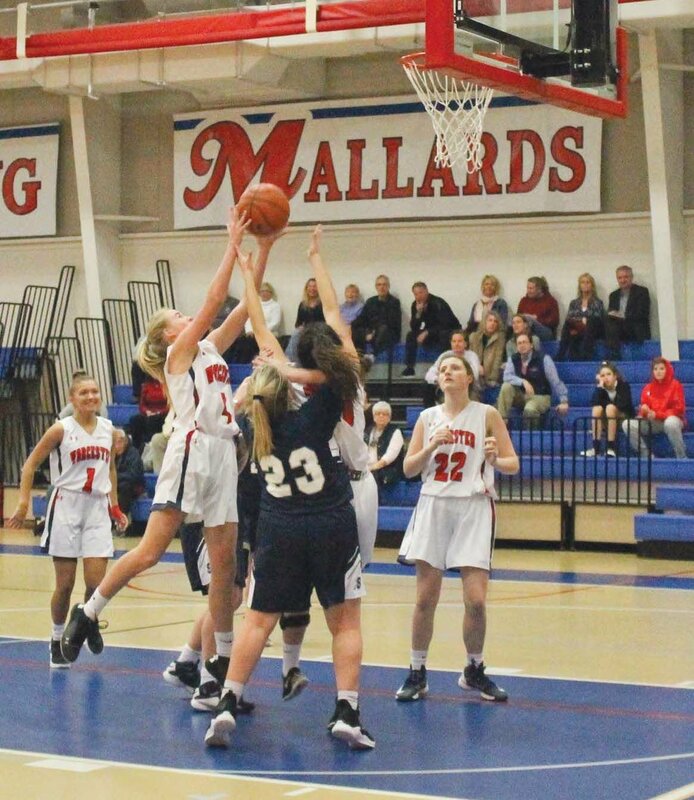 1 seed, the Mallards will host the fourth-seeded Salisbury School Dragons in the Eastern Shore Independent Athletic Conference semifinals on Tuesday at 4 p.m. The Prep squad won 61-11 and 40-8 over Salisbury during the season. The winner will face either the Salisbury Christian Jaguars or Delmarva Christian Royals, Thursday at 5:30 p.m. If Worcester wins on Tuesday, the team will host the championship game. Overcast. A stray shower or thunderstorm is possible. High 64F. Winds ENE at 5 to 10 mph. Cloudy skies this evening followed by scattered showers and thunderstorms overnight. Low near 55F. Winds ENE at 5 to 10 mph. Chance of rain 40%. Cloudy in the morning, then thunderstorms developing later in the day. Storms may contain strong gusty winds. High around 70F. Winds S at 15 to 25 mph. Chance of rain 90%.